A man who gave his dog to a friend then asked for it back has been told by a court that the "gift" cannot be returned. 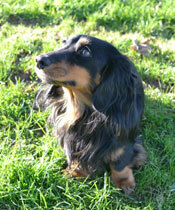 Gary Rowlinson, 55, from Cheshire, gave the mini-daschund to a friend because the dog had bitten his granddaughter. While asking for the animal to be returned, Mr Rowlinson reportedly offered his friend £1,000 for the dog, called Bailey. Mr Rowlinson then took his friend to court to try to retrieve the animal, under the Return of Goods Act. Stockport County Court has now settled the case, ruling that because Bailey was a gift it cannot be taken back. Mr Rowlinson, a joiner from Offerton in Stockport, said his family is devastated without the dog which cost £700 when bought as a puppy. Following the hearing, Mr Rowlinson told the Granada Reports news programme: "The judge has made his decision and I said I will abide by that. I will have to get on with my life and put it behind me."